BookNook — Young Adult book reviewsMy enjoyment for Natural Born Angel is all over the map, and that's one of the reasons why I was so unsure about how to rate it (and I'm still kind of unsure). That means, it's time to whip out the ol' Enjoyment Graph so you can get a sense of how I felt while reading the book:My Enjoyment Levels — MonitoredAs you can see, things started out strong. I was really excited to dive into the book, and when Maddy decided to become a Guardian, I was pumped! But any time the book swerved away from Maddy and onto Detective Sylvester, I lost interest. I just couldn't bring myself to care about his investigations or the Angel politics. But then when we would go back to Maddy's (or Jackson's) chapters, my interest would spike again. But towards the end of the book, I started to even dislike Maddy's chapters.One of the main reasons why I'm so unsure about this book is because Maddy and Jackson start to have relationship problems. Jackson has lost the ability to fly (possibly forever), so when Maddy decides to become a Guardian, Jackson is jealous. He's not only jealous because she can perform Guardian duties and he can't, but also because she is now the center of attention media-wise. I do think that these doubts and problems are realistic, but they still made me not enjoy the book as much. It completely makes sense that Jackson would be upset when his whole world changes, and would resent Maddy a little for stealing the spotlight from under him. But I hated that it had to come between them. Just because it's realistic doesn't mean I enjoy reading about it.And with a wedge driven between Maddy and Jackson, we get.... a love triangle. See that huge drop off at the end? That was the love triangle (I don't really think that's a spoiler because it's pretty obvious that it's developing from early on). Honestly, it was just RIDICULOUS. I could sense the love triangle from the moment Tom was introduced, but it never actually went anywhere.. until the end. Then, suddenly, at the end, Tom was declaring his LOVE for Maddy? What the hell? Except for one kiss, they had zero romantic involvement or chemistry (even the kiss was super random). The book itself made it seem like they only met in person three or four times, but suddenly he LOVES her? It was ridiculous.I think that the only problem writing-wise is how much Scott Speer relied on television news announcements to explain the politics and other big events. Because news is essentially "telling" or reporting, it felt like we were always being told what was happening in the world rather than being shown what was happening. A few news announcements now and then would be fine, but it seemed like every big event was given to us in the form of Maddy watching it on TV and the author writing out the television announcement. We never saw anything develop in the actual world around us.But despite my annoyances, there were still some interesting points in the book. Once the investigations and all that jazz got "solved" I was actually really interested in it (see huge spike near the end of the graph). There were some extremely intense moments and things overall really got amped up a notch. Prior to this point, the book felt a little slow moving, but suddenly it was all a whirlwind, and I loved it! I feel like the series is headed in a very cool direction and I'm looking forward to seeing how it plays out. I particularly like the role that Jackson will play!There is definitely a good vs. evil war coming, and people are picking sides. Maddy, in particular, is torn in the middle. As half-human, half-Angel, she doesn't know which side to give her allegiance to.I do feel like this book shows how much of a grudge holder I am. The humans (specifically the president) decide to ban all Angel activity. They're not allowed to fly, use super strength, make saves, or use any other supernatural powers they have. Then, suddenly, the demons invade the earth and the humans are like, "Lol just kidding. Now that we're in trouble, please use your super powers to help us! "Good people like Maddy believe that the Angels should help the humans, because otherwise they'll all die. I say: screw the humans. They basically banned Angels from existing... until it was convenient for them to have Angels around. What douchebags. 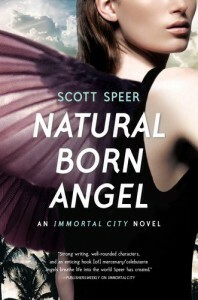 They dug their own grave and now they can lay in it.Yes, I hold grudges.Natural Born Angel wasn't a perfect book, and I definitely enjoyed Immortal City more. But at the same time, I don't think Natural Born Angel was particularly a bad book. The problem was simply that it was riddled with problems and information that I personally did not care for. I'm one of those girls that hates it when relationship problems dominate a book. Have one or two fights—fine. But to have the whole book be one distanced relationship? That's not for me. I really fell in love with Maddy and Jackson in Immortal City and I just hate that they were so separated throughout Natural Born Angel.But I am super curious to see how things play out. Assuming the horrible love triangle gets shot down fairly quickly, I am confident that the third book will be better than this one.